The Spring 2019 quarterly meeting of the Monadnock area chapter of 100+ Women Who Care will be held on Wednesday, April 17, 2019 at the Peterborough Players, 55 Hadley Rd, Peterborough, NH . Please note the change in meeting day from Thursday to Wednesday. Doors open at 6:00 p.m. The meeting starts promptly at 6:30 and concludes at 7:30 p.m. 100+ Women Who Care Monadnock provides grassroots support to local charities that serve 14 towns in the Monadnock area. Since its inception, this organization has distributed over $180,000. At this meeting, attendees will hear presentations from three charities randomly selected from this quarter’s six semi-finalist nominees. The membership will select one charity to receive this quarter’s collective funds. Each member then writes a check for $50 to the selected charity. If you are interested, join this amazing group of women for the meeting on April 17. No registration is required. 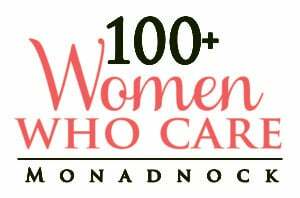 For more information about 100+ Women Who Care Monadnock and for information on joining, visit: https://www.100womenwhocaremonadnock.com or email: ssmithwwc@gmail.com.